Sen. Ted Stevens was not one of the surviors of last night's plane crash in Alaska that killed five persons. Ex-NASA chief Sean O'Keefe and his teenage son were among the four survivors. More details on survivors and the crash here. 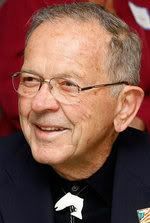 Stevens, 86, was the longest serving Republican senator in history. R.I.P., Sen. Stevens. Among his legacies: Bringing to public attention the issue of the Government concealing exculpatory evidence in criminal trials. U.S. District Court Judge Emmett Sullivan officially tossed former Senator Ted Stevens' conviction today due to prosecutorial misconduct. A federal judge in Washington on Tuesday threw out the criminal conviction of former Alaska Sen. Ted Stevens because of prosecutorial misconduct and ordered a criminal probe into the Justice Department's handling of the longtime lawmaker's corruption trial. "In nearly 25 years on the bench, I've never seen anything approaching the mishandling and misconduct that I've seen in this case," U.S. District Judge Emmet Sullivan said at the hearing, granting a government motion to throw out the conviction and dismiss the indictment. The Justice Department has asked a federal court in Alaska to throw out the conviction of former Senator Ted Stevens. In a statement, Attorney General Eric Holder said he and other Justice lawyers had reviewed the case and "concluded that certain information should have been provided to the defense for use at trial." "In light of this conclusion, and in consideration of the totality of the circumstances of this particular case, I have determined that it is in the interest of justice to dismiss the indictment and not proceed with a new trial," Holder said. U.S. District Judge Emmet G. Sullivan called it "outrageous" that government lawyers would ignore his deadline for turning over documents. Last month, Sullivan told the Justice Department to turn over all its internal communications regarding a whistleblower complaint against the FBI agent leading the investigation into the former Alaska senator. Remember the juror in the Alaska trial of Sen. Ted Stevens who didn't show because her father died? It was a lie. She went to a horse race. U.S. District Judge Emmet Sullivan let her go, saying that he was going to "accept Mr. Kramer's representation that you were not able to (deliberate) and for reasons that were serious to you." He added: "I'm convinced you were not able to deliberate." She also said had she deliberated, she would have voted to convict.